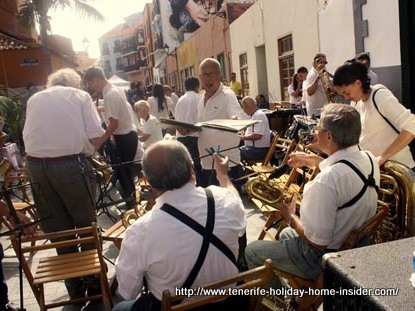 Spain events Tenerife live music concerts in resorts and much more. Events Tenerife Spain are so numerous. There are also its many holidays which are lovingly called Fiestas or Festivals. 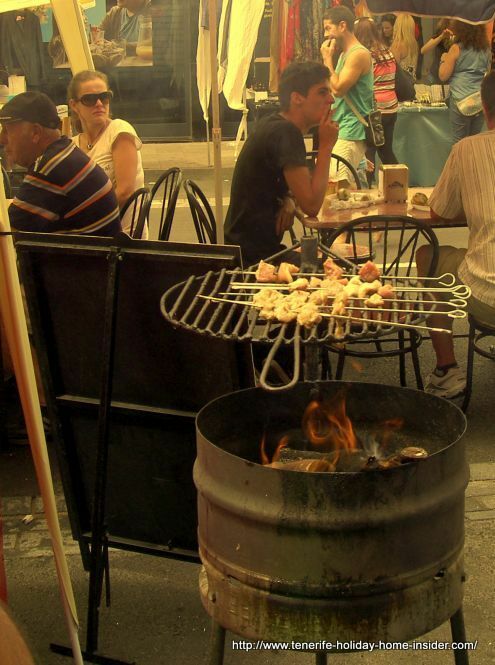 Have you heard of a food truck festival? Tenerife Moda Spanish Fashion show with possible surprises and new designers coming up on June 30, 2018 at the open Market zone of la Longuera. 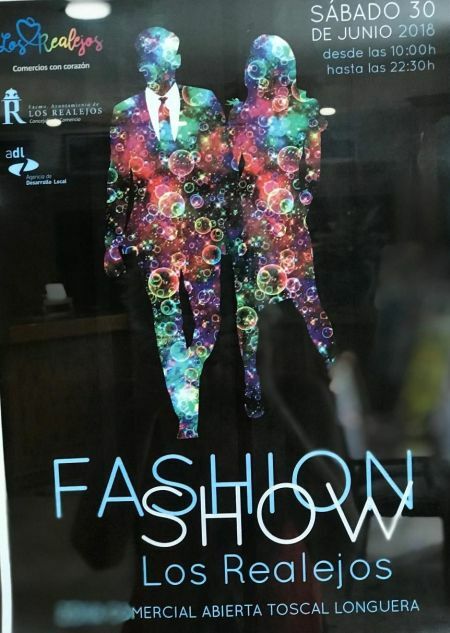 Events Tenerife poster for Toscal Longuera June30 of 2018 for Spanish fashion show. Following suite are July celebrations. They are fiestas that don't only take place in la Orotava. They are also celebrated in the capital Santa Cruz on the 25th regarding the defeat of Sea Admiral Nelson. Otherwise, more than one Fiesta del Carmen are to come. They excel in Los Realejos and and Puerto de la Cruz by the middle of the month. They play a major role together with Romerias and fireworks. White Nights Noche Blanco festival Puerto de la Cruz on December 02, 2017 similar to before but beer Cañas for Euro 1 at Café Ebano with Plaza Iglesia concert and according party evenings at Blanco Bar, Club Azucar with Noche Rumba as well as surprise event at Play Music Bar. Nativity scenes exhibitions Puerto Cruz daily for Nativity art starting December 02 at 9.30 p.m. with additional folk concerts on December 09 at 8.p.m, Dec.16 and 17 at 8p.m., Dec.23 at 7.30p.m. and on Dec.30 at 8p.m. VI International festival Agatha Christie Puerto Cruz from 6th to 12th of November, 2017. 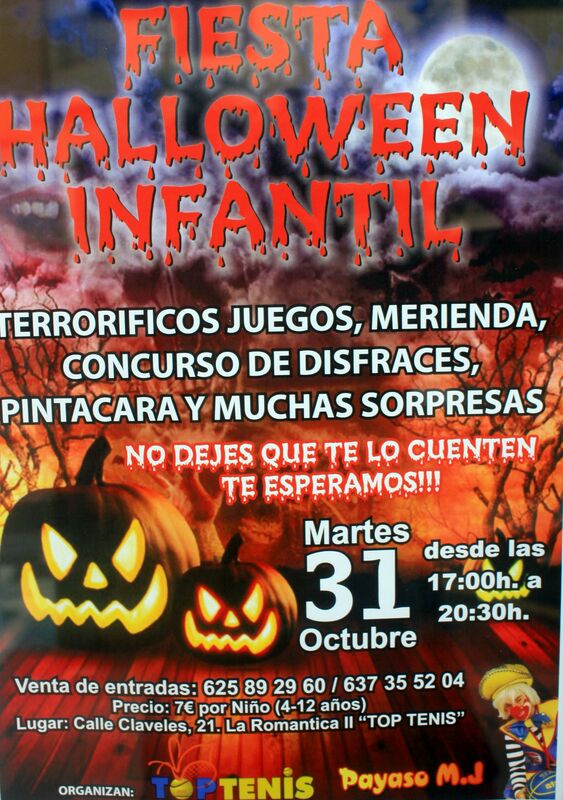 Events Tenerife for Halloween 2017. 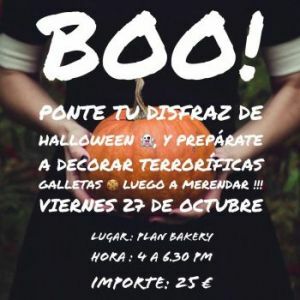 Reserve for the Boo party on Friday October 27 from 16.00h to 18.30h at the Facebook Page of the Tenerife Vegan Café. Plan Bakery the Café invites girls dressed the part to help with BOO! cookie decorating and Halloween party afterwards for a fee of Euro 25. When? Tuesday October 31 from 5p.m-to 8.pm. Organizers: "Top Tenis" and Clown Payaso. 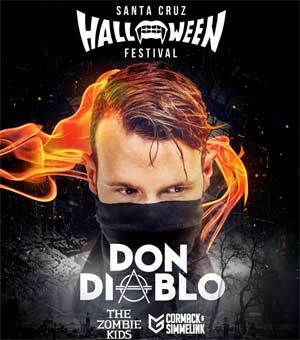 The usual yearly big Halloween Rave indoor party with live music at the most important concert event disco in Tenerife North and DJ music at its new neighbor. When: On October 31 from 10.p.m. - 5 a.m.
Yearly Fiesta time in Toscal Longuera again. 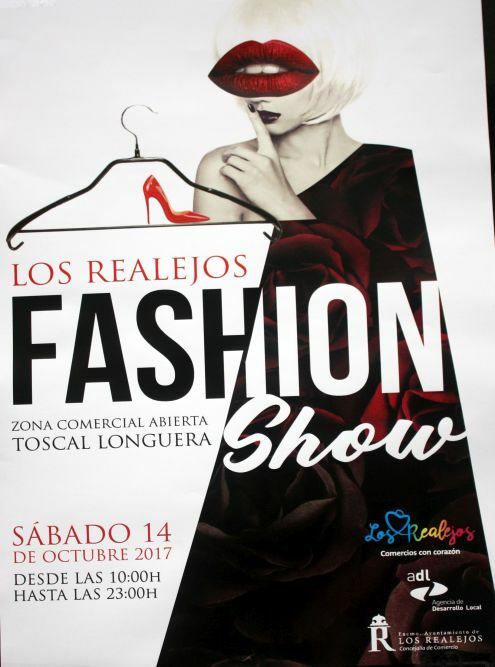 Fashion show Toscal Longuera 2017 on October 14 from 10 a.m.-23 p.m. There will also be sports shows, kids entertainment and craft sales besides free food and the Toscal Longuera fashion show. Tenth international Boreal events Tenerife in Los Silos. When? From the 13th of September over 4 days. Food? Street food stalls for the hungry and the thirsty celebrators. More happenings now and later in September 2017. 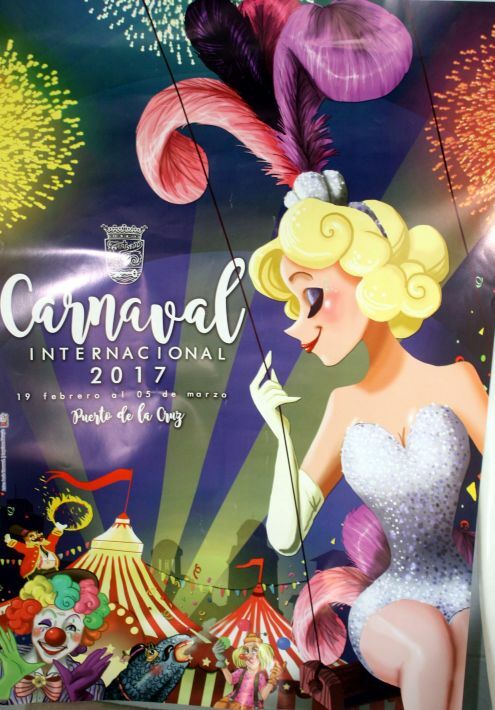 There is the second summer Carnival of Tenerife starting with Puerto de la Cruz celebrations September 15 to 17. 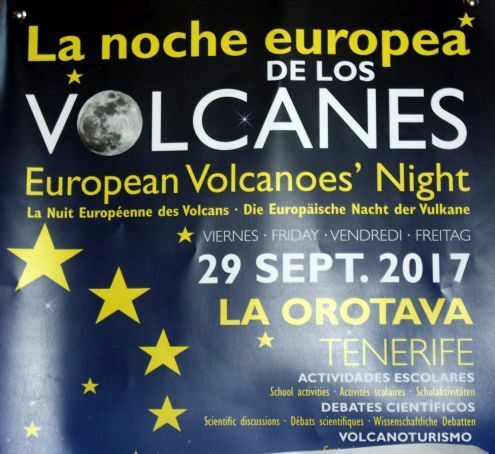 European volcanoes night a scientific and educational event in La Orotava advertised by a poster. 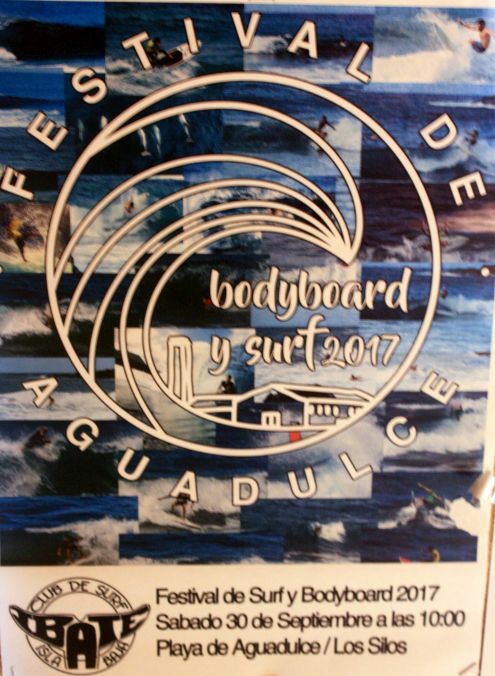 Los Silos surf and bodyboarding festival on Playa Agua Dulce on September 30. 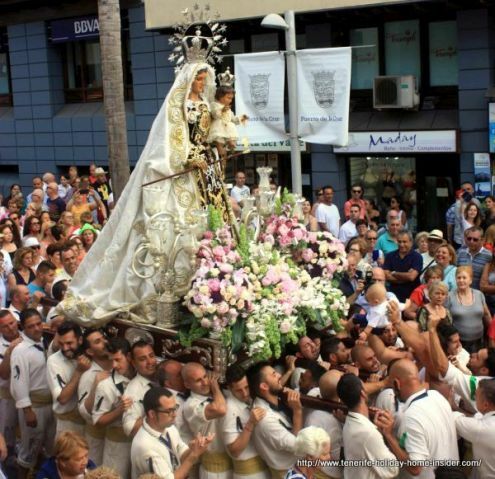 Lady of Carmel carried by seamen and fishermen during a street procession. 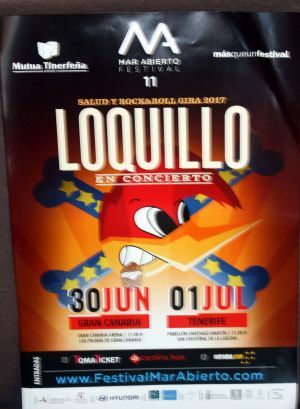 More than one event of this kind takes place in 2017 in July in two neighboring Tenerife towns that are united on one of the days. One in Puerto de la Cruz on July 11 and the other, also a must see on July 23. Both happen shortly after 7 p.m. 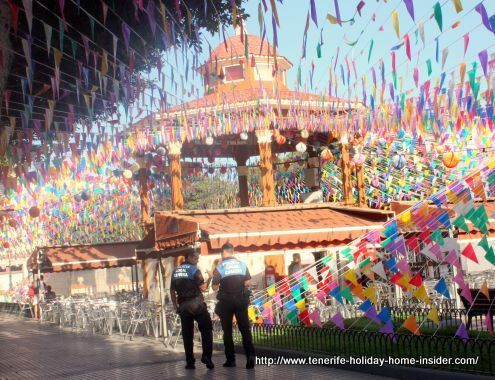 Discover more photos and a fascinating review in this context about events Tenerife which happen every year. The new and free international Arona day time Music Festival RNA of the LGTBIQ scnene from June 5th to June 11th 2017 is expected to become an annual event. Middle of May La Mueca events. Events Tenerife La Mueca in 2017. Click the above photo to see a caleidoscope of events, such as jazz concerts and other art in the street by the La Mueca festival. 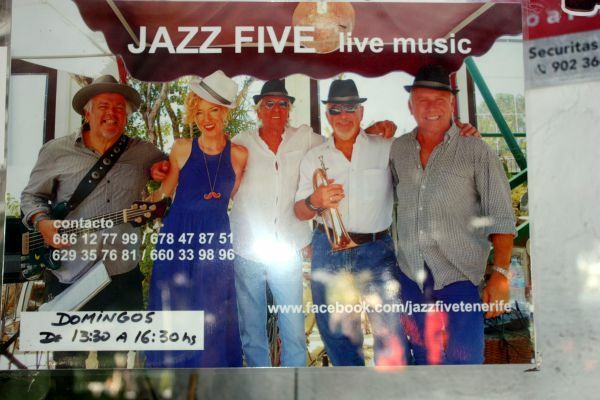 Three day Heinecken Jazz festival during 31 days Fiesta del Carmen Puerto Cruz. 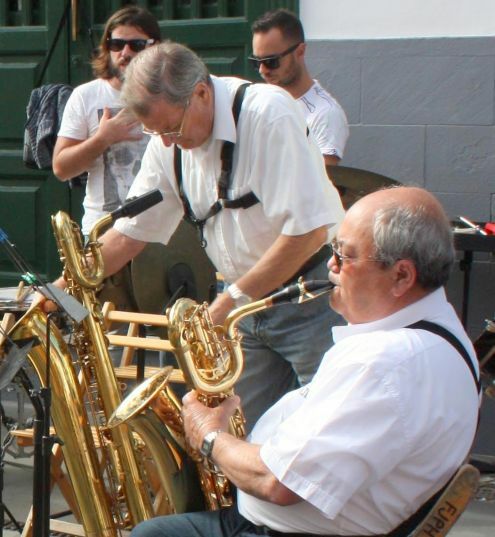 Live Jazz music is again on the agenda on the week-end July 21 - 23 at night on Plaza de Europa. This is only one festival of an action packed month in Puerto de la Cruz for summer holidays in Tenerife. 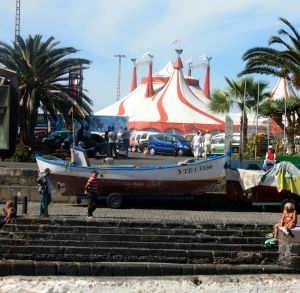 The main attractions will be by the Muelle where the fisherman guild takes the town patrons the Virgen del Carmen and San Telmo for rides on the sea. 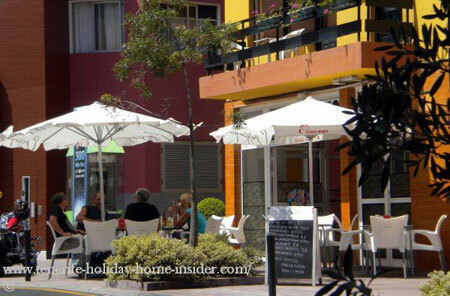 However much more thrills may be expected as events Tenerife in the oldest island resort. Fiestas de la Cruz beginning of May. Fiesta de la Cruz of yearly events Tenerife. 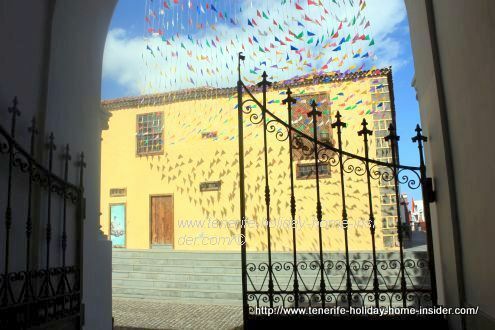 These annual, religious celebrations take place in many towns and Tenerife villages. The Cross of Jesus is to be decorated in all Catholic temples and on tiny road altars in often very artistic ways. The north is highly prominent with it in Los Realejos and Puerto de la Cruz. 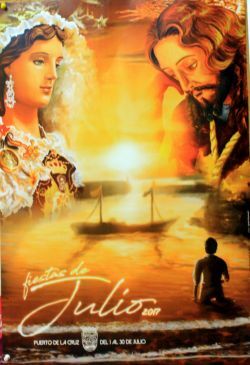 Admire the decorations in 30 Puerto Cruz chapels on the 3rd of May 2017. 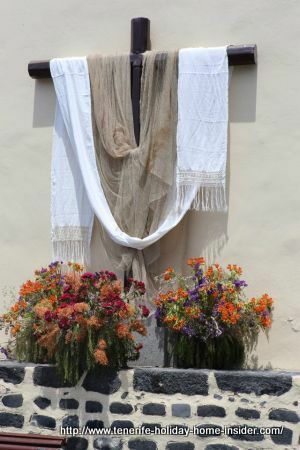 The May festivals of Los Realejos with its first three days that are dedicated to the Holy Cross has festivities over several days. They are Sports events and three hours of fireworks competitions. Part of it is the traditional Fiesta in honor of Saint Isidore Laborer and Maria de la Cabeza at the end of May. Puerto de la Cruz Aqua Circus on Ice for €10 by the Muelle until February 18th of 2017. Call 662 612 826 or go to their website called Circo Alegra y Taquillas. Indeed, the extraordinary Puerto Cruz carnival is very important and as much fun as the one in Santa Cruz the capital. Note that both Coso parades are always on the same day. Just park your car by the Muelle which is another advantage with Puerto Cruz. And it's for free. February March is the mad disguise season, main carnival agendas of which have been published by now. Always check at Restaurante La Casona Puerto de la Cruz as well as at Finca Del Arte by Los Cristianos. Click photos for more information. 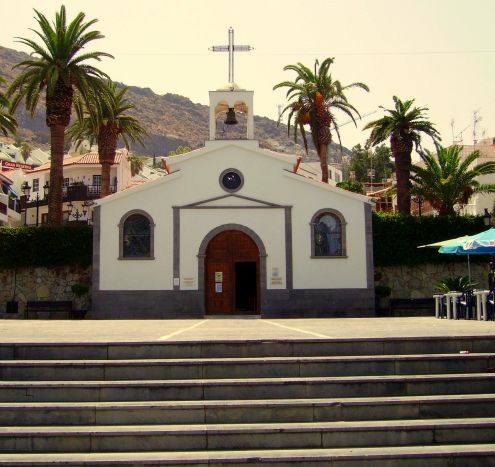 On February 16, 2017 at 10,30 a free of charge Jazz Gospel concert on Plaza Bouganvilla, 6 of Iglesia Espiritu Santo at Puerto de Santiago Tenerife. Refreshments and Cake for sale at the Church tea room besides the paintings. Call Jacqueline Hankin at 922 738 143 for more information. Events at the Taperia Punto de Encuentro Bar at La Longuera 60 of Realejos. 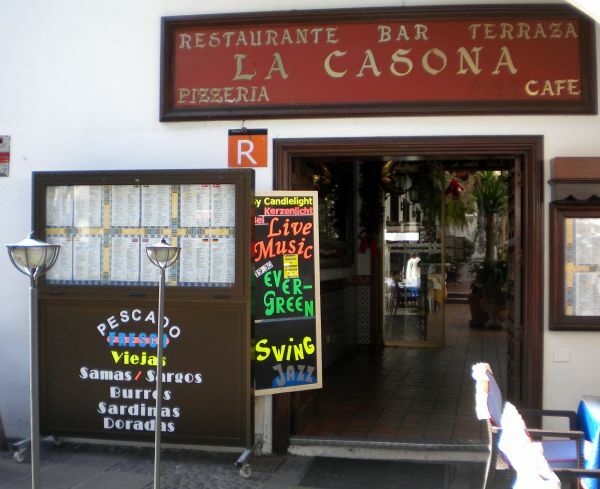 This Taperia used to go the extra mile with live music for dance to make it exciting to eat Spanish Tapas while going out in Tenerife on Saturdays. Of course with free entrance but, you had to order a drink, at least. Unfortunately, the Tapas bar closed its doors. However, they contacted me again, as they would like to feature online again. I am sorry not to be able to help them at the moment. They are now below the Thai restaurant of the Puerto Palace Hotel in Puerto de la Cruz. I miss their live entertainment with dance very much. Cafe de Paris Tenerife North for live music and dance. Cafe de Paris street terrace. 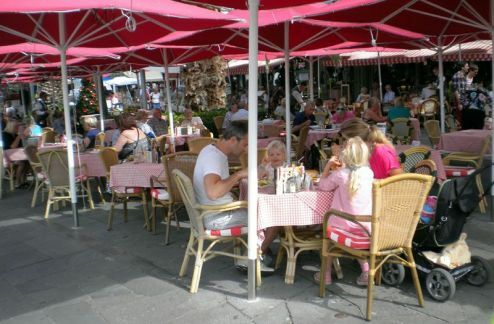 Café de Paris the genuine French style Tenerife cafe is a good place in Puerto de la Cruz for varied live music. Sometimes people dance there inside and not on the terrace. That may be even in the afternoons when it's hard to find a seat on overcast days. Agatha Christie Tenerife festival Spain events 2009. 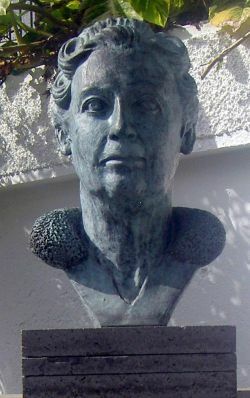 One of most popular events Tenerife is the yearly international Agatha Christie festival of Spain Puerto de la Cruz, early in June. 13-17th of September 2017 will be next. In 2011, it organized something unheard of until then. It was a dinner invitation for a live night show at Pueblo Chico (now closed) in La Orotava. The company Escena del Crimen (crime scene) performed 'The mystery testament of Don Cesare' in Spanish. Dinner guests spectators could all be actors. They could win a price to help solve the crime puzzle. These shows took place twice in November and early December 2011. A really nice touch by the oldest Tenerife resort to commemorate one of its so called honorary daughters who has a street in her name in Puerto Cruz La Paz. 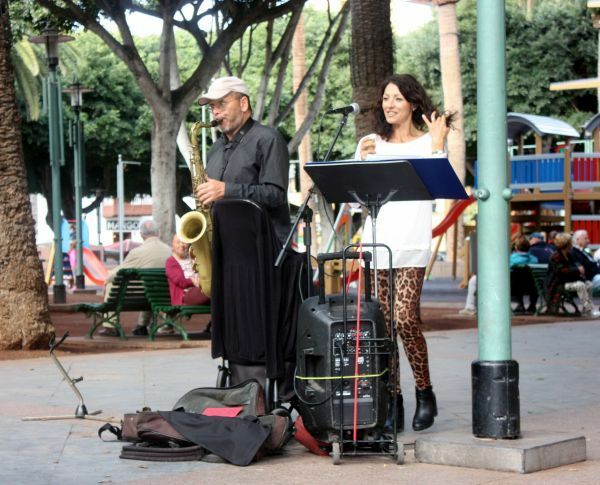 Tenerife Jazz band events with Anna Rodriguez and Three. Tenerife events dance and concerts La Baranda. Events Tenerife Mansion Abaco Puerto Cruz. is a review about a special concert night at the high class Mansion Abaco Puerto de la Cruz. Please note, the Abaco Mansion Museum has nice and short folk music sessions for the public before lunch time almost all year round. Tenerife entertainment seen from various angles, such as adhoc below. Both the musician and the singer performed extremely well and for free. 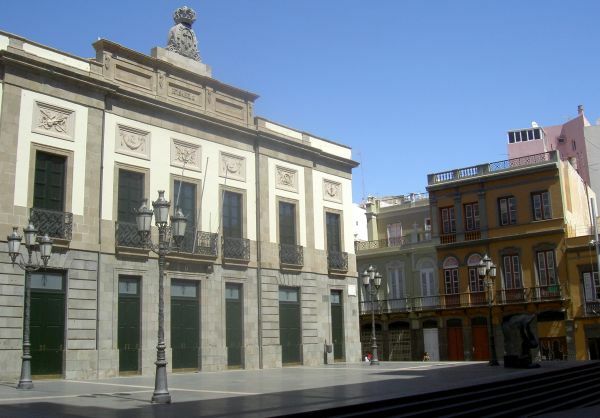 They were captured on camera on a popular town square in Tenerife North Puerto de la Cruz. Events Tenerife by Amerinca productions for live music concerts. 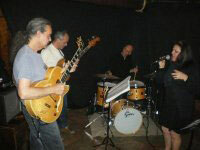 The above video of Restaurant Amerinca is in remembrance of the live music of Amerinca productions s.l. and their owner Nicola. Their music shows used to be of very high quality. 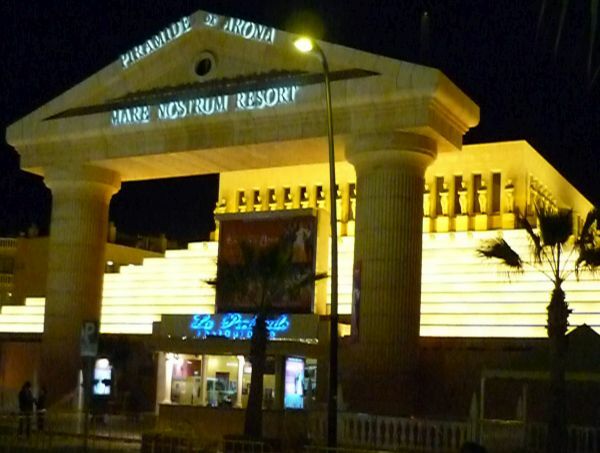 They played at many top Tenerife hotels including the 5star Hotel Botanico, where they were heard last.